Mosquitos can ruin a beautiful summer. Just when the weather gets beautiful and you are ready to go with the barbeque, out come the mosquitos buzzing around and driving you crazy – and itchy! No one wants to start spraying chemicals on your outdor party, so if you could grow a beautiful plant that will also keep them away, well of course you would do that. The good news is that such a plant exists. 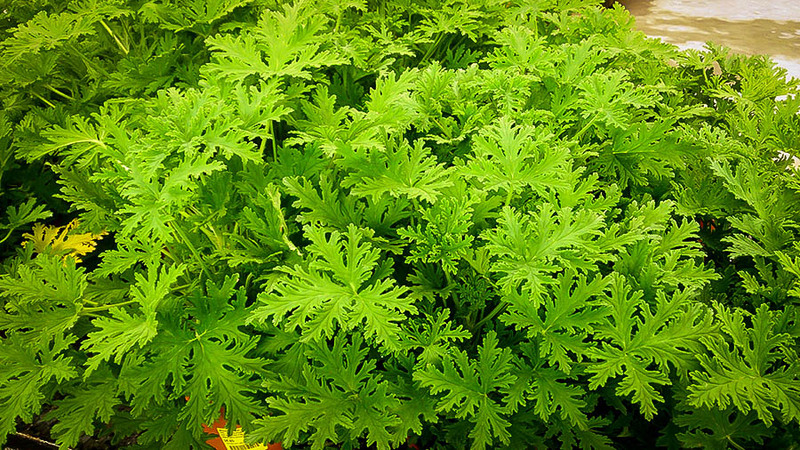 The Mosquito Plant, also called Citronella, is a relative of the red geranium everyone knows and it produces a chemical called gereniol. Research has proved that this chemical will drive mosquitos away. Luckily for us humans it also smells beautiful and lemony, so your Mosquito Plant will smell great to you and deadly to mosquitos – just perfect! The Mosquito Plant is called Pelargonium citronellum and it is an easy–to-grow, drought-resistant plant from South Africa. It will grow happily in dry conditions and the only thing it doesn’t like is cold. So if you live in warm areas where it only gets down to a degree or two below freezing, you can grow this plant right in your garden. It will reach about 6 feet tall and 3 feet across and grow in any soil that is not wet, preferring a dry, sandy location. It also does best and repels mosquitos best if planted in a sunny spot. So if you live in Florida, southern California or southern Texas, plant it and forget it. If you live in cooler areas you can still put your Mosquito Plant in the garden, just remember to dig it up, prune it back and put it into a pot for the winter. Do that before the thermometer gets down below 40 degrees. Bring your pot into a sunny porch or into the house and keep it on the dry side all winter. If you have a long, cold winter in your area, it is probably best to grow your Mosquito Plant in a pot all the time, just moving it outside for the summer and inside for the winter. The Mosquito Plant is a pretty plant, with leaves shaped like a hand, wrinkled and with some soft hairs on them. The flowers are in clusters and they are produced all summer long. They are purple-pink in colour with a dark-purple blotch on the upper three petals. Over time older stems become woody and your plant may even grow a short trunk.It forms a small shrub and you should trim it back in early spring so that it stays bushy and compact. Trimming will also encourage new leaves with the maximum amount of mosquito-repelling gereniol in them. To grow a Mosquito Plant in a pot, choose a pot with drainage holes and use half regular potting soil and half cactus soil to grow it in. Let the soil get almost dry between watering and even if you forget to water it at all, it will not die, but just stop growing until you remember to water it again – this is a really easy plant to grow! A little liquid fertilizer during the growing season will help to keep it bushy and healthy, but even that is not essential. It is also resistant to most pests and diseases and even does better if a little neglected – too much water and your plant could rot. So if you are pestered by those pesky mosquitos, get yourself a Mosquito Plant or two. Grow them on your patio in pots, or plant them in the ground beside your barbeque and you can enjoy summer without fighting off those terrible pests. This easy-to-grow plant will make your summer fun again.